He Skipped Leg Day. We Didn't. 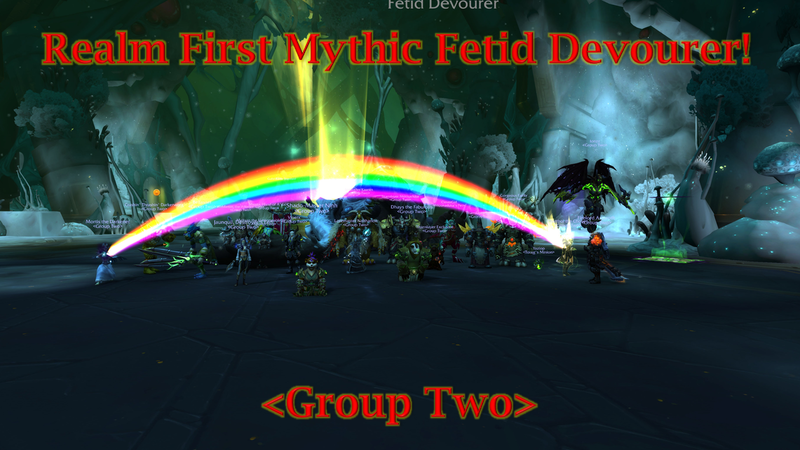 In a surprising turn of events late Thursday night, and by the power of last pull, we managed to down Mythic Fetid Devourer! We were mere milliseconds from disaster, but we snagged victory from the jaws of defeat. We picked up on the positioning/DPS requirements on this boss much faster than I expected. Good work to everyone! Up next is a boss we're fairly well prepared. It's time to stack the rogues, bring the Priests, and melt Zul in under 4 minutes! After several dozen pulls, we finally managed to take down yet another Mythic Uldir boss! 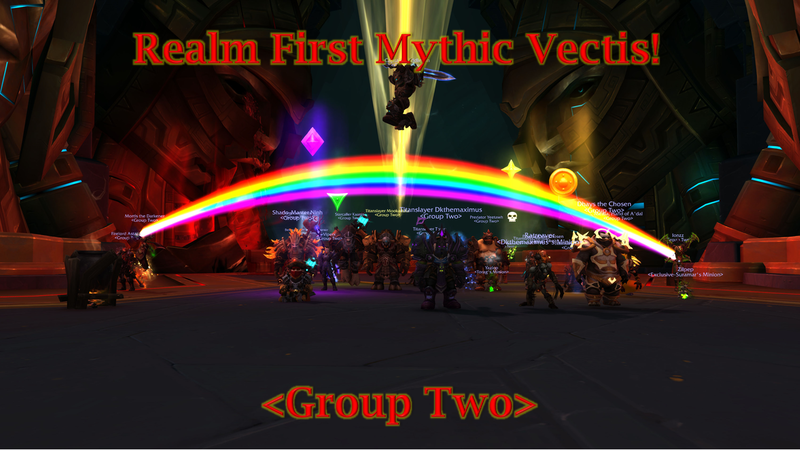 This time, Vectis fell before our feet. It took some practice, but we finally killed the boss while only using Flasks/Vantus Runes. No DPS potions, Augment Runes, or feasts were needed! Well done to everyone for proper execution, and hopefully we can continue that in farm during the coming weeks. Next up is the big wall of Mythic Uldir; Fetid Devourer. He will be a challenging DPS check for the raid team, but we can hopefully come out on top at the end of the day! 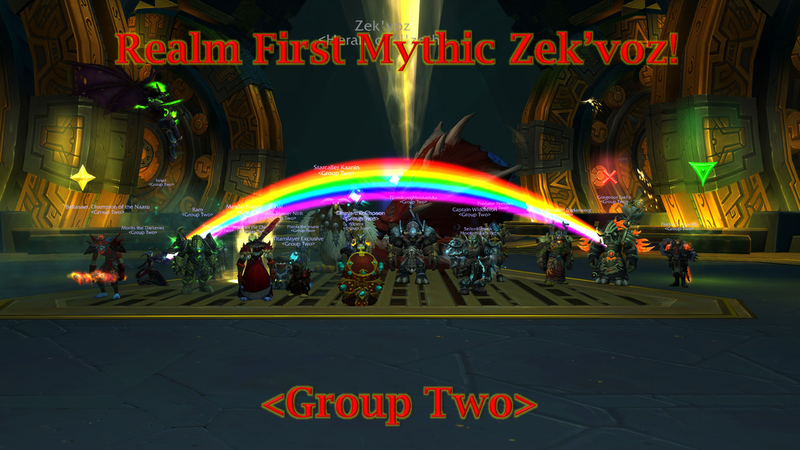 Apologies for the severe delay in this post, but around a week and a half ago we finally managed to take down Mythic Zek'voz! It took quite a few pulls, but we finally got it down on a pull where we didn't even have Reincarnates available from the Shamans. Good job to the whole group for handling the adds properly and spreading/stacking when needed. The background of the screenshot makes for a pretty cool setup for a killshot, so enjoy. Vectis is next on our list, and as of this point in time have gotten him to 22% twice. Let's get him down and get to Fetid!